Delamotte is often called the "sister house" to Salon. Although they have very different styles, they both specialize in Blanc de blancs, are both owned by Laurent Perrier, and use the same winemaker and facilities. Delamotte makes several wines, not only Blanc de blancs, and Salon of course makes only a vintage Blanc de blancs and only in the best years. 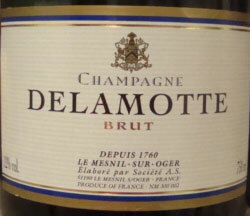 Salon does not go through malolactic fermentation while Delamotte does. While Salon's wines are big, powerful, and demand aging, Delamotte are much more on the feminine side and drink well young. Unused Salon grapes (Salon is not produced many years) often, but not always, end up in Delamotte. It is not simply declassified Salon! Salon is the far superior wine, one of the best on the planet, regardless of style, a Delamotte is nice wine as well. Located in Le Mesnil, they were founded (originally in Reims) in 1760 by Francois Delamotte, a vineyard owned, making them a very old house. His son, Alexandre, moved them to Le Mesnil (officially called "Le Mesnil-sur-Oger") in the late 1700s. They produce about 50,000 cases a year making them pretty small. Chardonnay comes primarily from the villages of Le Mesnil, Avize, and Oger. Pinot Noir comes from Ambonnay, Bouzy, and Tours-sur-Marne. Pinot Meunier, used only in the Brut, comes from the Marne Valley. Grapes are hand picked and sorted. Blanc de blancs Non Vintage and vintage, - All Chardonnay with the often much superior Vintage being almost the same wine with more time aging on its lees. The nose has sourdough bread, apple, and a lovely maritime style minerality. Palate has slight creaminess, dilute apple, and a little orange. I like the nose better than the palate. The nose is very nice and mostly about minerals. The palate, although not at all bad, could use more "ummmppphh." It is the entry level wine after all!